Try making burritos or tacos for the slopes. Snow cooking is higher in carbs that you burn off when on the snow, skiing or boarding. Some of us in the Pacific Northwest wait all year for snow to arrive in the mountains. It’s a good year if you can ski or snowboard by Thanksgiving, and even better if conditions allow spring skiing. Cross-country skiers and snowshoers come out in numbers. Whether skiing, snowboarding, snowshoeing or just playing in the snow, you need food that has enough carbs to give you quick energy, enough protein to keep you feeling full several hours, and enough fat to keep you warm. Think of your meals as if you were lighting a fire. The carbohydrates are like the paper that gives you quick energy. Like paper, carbohydrates get the fire started, but don’t last long. Protein is like kindling, the small branches you put on a fire; it burns and provides energy, so you are still happy two hours later. Fat is that big log that burns for hours, keeping you toasty warm until you get back to the car. 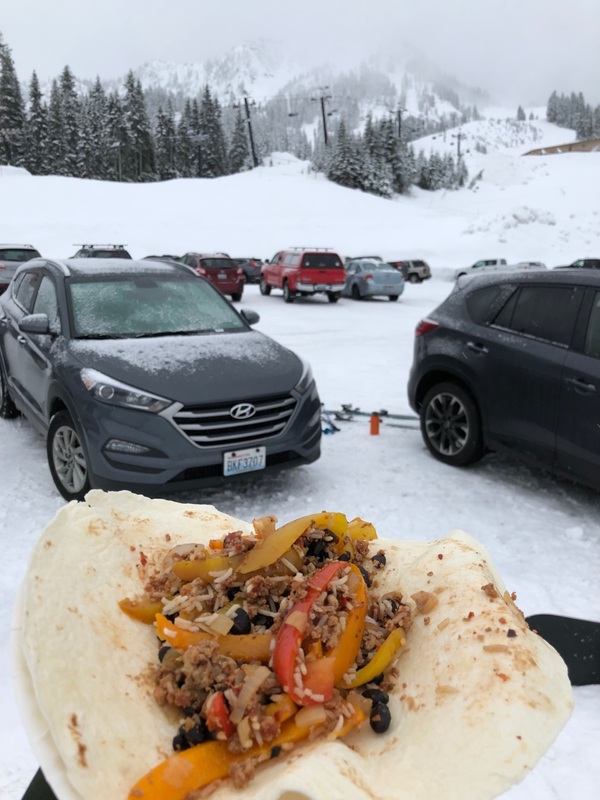 Food sold at ski areas is usually high in salt and expensive, so many people bring a brown-bag lunch or “snowgate” (have a tailgate party in the snow) in the parking lot. You never have to take off your gear! Some people pack sandwiches for their ski meals. There is nothing wrong with a hearty tuna or peanut butter and jelly — each gives you the carbohydrates, protein and fat for your internal fire. But warm meals are much more comforting. Try making burritos or tacos for the slopes. Cook the meat filling ahead of time and take it with you. Most lodge cafeterias have a microwave available. If you are adventurous, use a Coleman or backpacking stove to reheat the filling in the parking lot. Another good option is a thermos of homemade soup or hot cocoa to keep your inner fire going. My family sometimes brings a picnic basket or rubber tub filled with delicacies. Everyone looks forward to a variety of food - anything from hummus and pita, beet salad with blue cheese and pecans, tangerines and almonds, to tuna salad on tortillas, snickerdoodles, salt-free pickles, peanut butter and celery sticks. Once on a trip, as my son and his friend were eating, a passerby commented that they had a “classy hamper.” Classy hamper has since become our new code for good food packed for a trip to the mountains. At home, brown ground turkey with onion, garlic and seasoning. When nearly browned, add peppers, beans and rice. Cover and let stand a few minutes. Put in a plastic container or zip-close bag and chill overnight in the refrigerator. In the morning, put container and tortillas in your trunk. If storing container inside the car, add a freezer bag to keep it cool. At home, mix all ingredients, adding mayonnaise and sour cream until you are happy with the consistency. Put in a plastic container or zip-close bag. Chill overnight in the refrigerator. Take along a box of crackers, a sliced loaf of crusty bread or corn tortillas to go with the salad. Serve with homemade or low-sodium canned soup. Heat olive oil in a large pot over medium-high heat. Add onions and stir to combine. Cover and reduce heat to medium and then cook, stirring occasionally, until onions are very soft. Add garlic and cook, uncovered, until soft, about 3 minutes. Stir in paprika and cook 1 minute. Add lentils, peppers, tomatoes and broth. Bring to boil and then reduce heat to maintain a steady simmer. Cover and cook until lentils are extremely soft, about 30 minutes. In 3 batches, blend or process soup until very smooth, at least 3 minutes per batch. Add dry milk and vinegar to the last batch. Stir together. Season with more vinegar if needed and add more water or broth if soup seems too thick. Makes 7½ cups, 4-5 servings. Double recipe and freeze for future use.